Tymoshenko set to sue Cabinet and energy regulator. 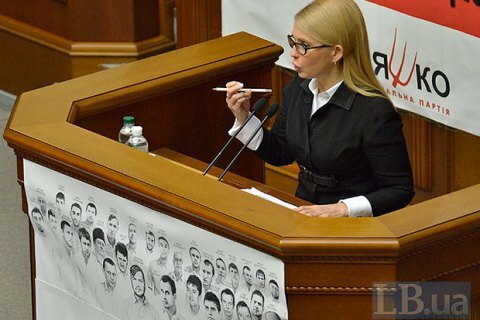 The political force of Yulia Tymoshenko Fatherland filed a lawsuit with the District Administrative Court of Kyiv against the recent increase in utility tariffs, the press service of the party stated on 23 June. "We filed an administrative lawsuit directly against Groysman and his government, which has taken an unprecedented illegal step by almost doubling the price of Ukrainian gas for the population, especially for the privileged categories," the leader of the party Yulia Tymoshenko said. "Neither the Constitution nor the law provides that the Cabinet of Ministers can established the price of gas." The second lawsuit was filed against the National Commission on Regulation of Electricity And Utilities Sector. The regulator did not have the right to set tariffs for central heating and water - it is the competence of local authorities and the fact that they got into someone else's competence, trespassed their official powers, and should be held responsible for that," Tymoshenko said. The leader of the Fatherland insisted that the Constitution of Ukraine lays down that utility tariffs should be feasible for the citizens. "I want our team to make this step and showed the whole of society: whether the court can be fair and reinstalls normal, reasonable price on Ukrainian gas or will the court again serve the clans, corruption and whims of Yatsenyuk and Groysman ? " Tymoshenko asks rhetorically.